Data visualization is the presentation of data (both qualitative and quantitative data) in graphical format. 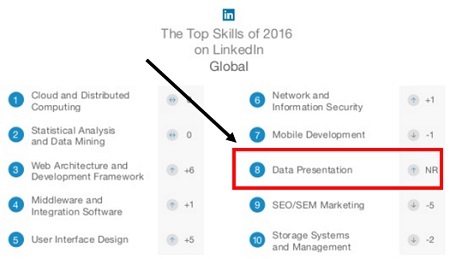 Data presentation is a very important skill for an optimizer (marketer, analyst). 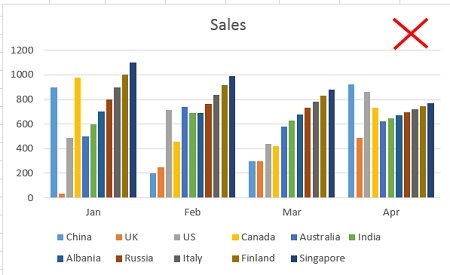 Excel charts are commonly used for data visualisation and presentation. But selecting the right excel chart is always a challenge. 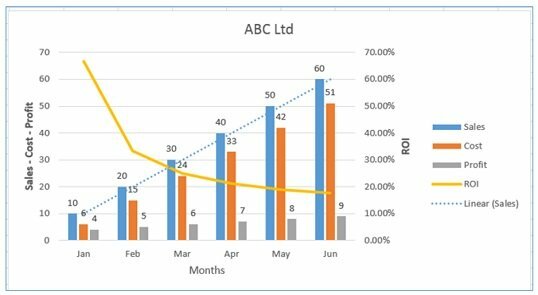 If you use an incorrect Excel chart for your analysis, you may misinterpret data and make the wrong business and marketing decisions. 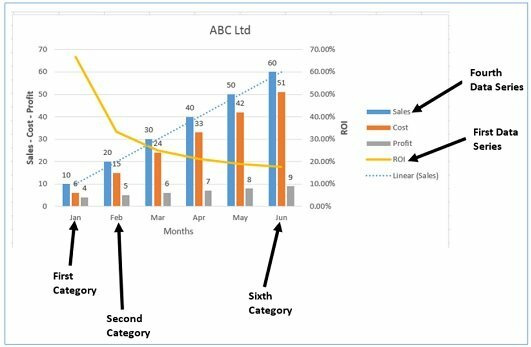 If you use incorrect an Excel chart for your presentation, then stakeholders may misinterpret your charts and take wrong decisions. 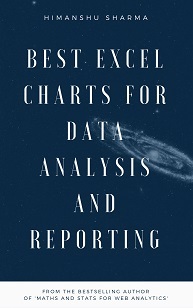 Therefore selecting the right Excel chart is critically important. 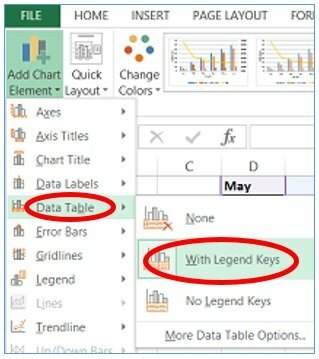 In order to read an Excel chart, it is important that you understand the various components of the chart. Categories – Here the first category is ‘Jan’, second category is ‘Feb’, third category is ‘Mar’ and so on. 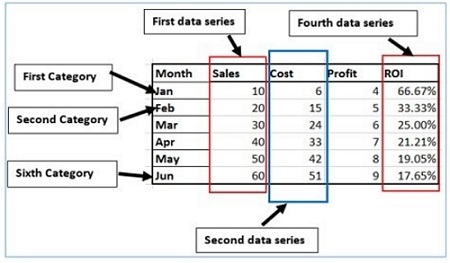 Data series – A data series is a set of related data points. Months are plotted on the primary horizontal axis. 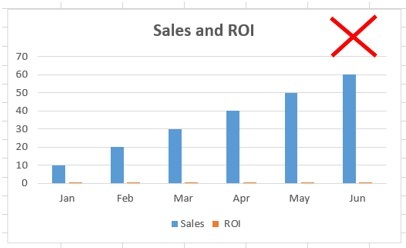 Sales, cost and profit are plotted on the primary vertical axis. 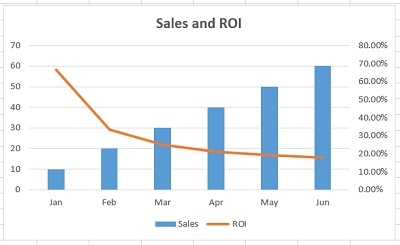 ROI is plotted on the secondary vertical axis. 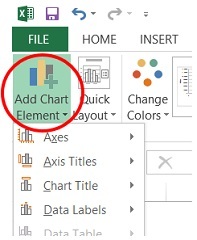 Step-1: Open MS Excel and navigate to the spreadsheet which contains the chart you want to edit. Quantitative data (also known as interval/ratio data) is the data that can be measured. For example 10 customers, sales, ROI, weight etc. Qualitative data is the data that can be classified/categorized but it can not be measured. For example: colours, satisfaction, rankings etc. Discrete data – quantitative data with finite number of values / observations. For example: 5 customers, 17 points, 12 steps etc. Continuous data – quantitative data with value / observation within a range/interval. 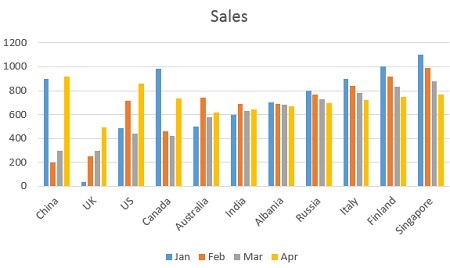 For example: sales in the last one year. 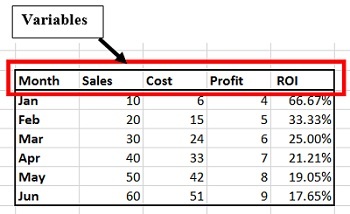 #1 Use a clustered column chart when you want to compare two to four data series. 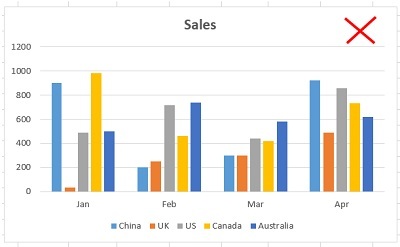 Alternatively, avoid creating a column chart which has got more than four data series. Now this chart, though still look cluttered, is much easier to read and understand. #2 Use a clustered column chart when the data series you want to compare have same unit of measurement. 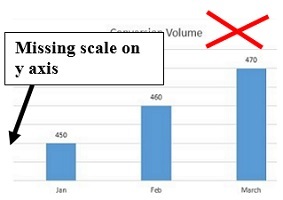 So avoid using column charts which compare data series with different unit of measurements. 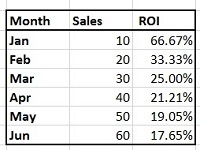 For example in the chart below ‘Sales’ and ‘ROI’ have different unit of measurements. 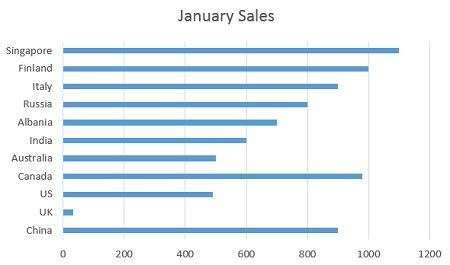 #3 Use a clustered column chart when the data series you want to compare are of comparable sizes. So if the values of one data series dwarf the values of the other data series then do not use the column chart. 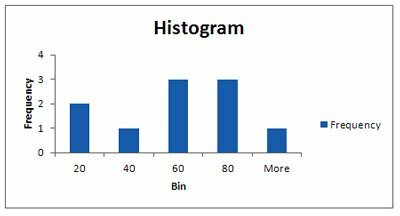 #4 Use a clustered column chart when you want to show maximum and minimum values of each data series you want to compare. 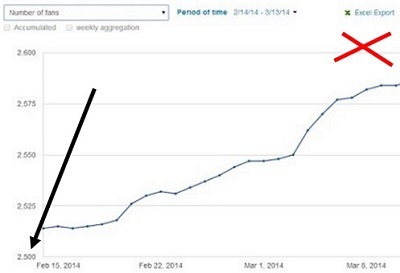 #5 Use a clustered column chart when you want to focus on short term trend (i.e. 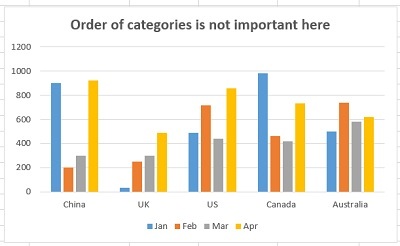 changes over days or weeks) and/or the order of categories is not important. 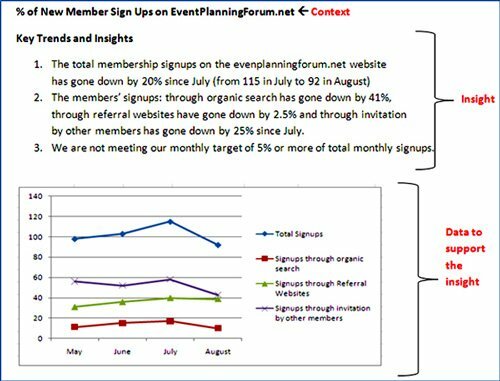 One method of making this chart easier to read and understand is by breaking it into several smaller clustered column charts. 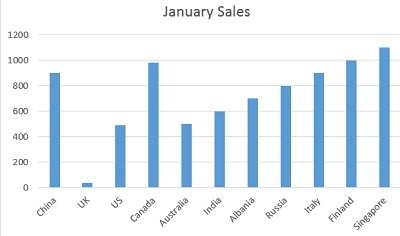 For example, you can create one column chart which just compare the sales performance of various countries in January. 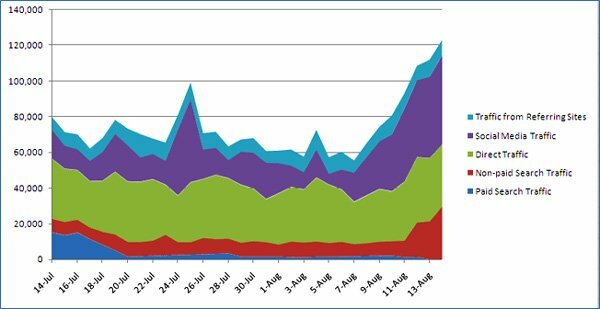 The rule of thumb is to avoid presenting too much data in one chart, regardless of the chart type you use. 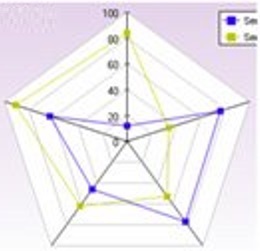 A combination chart is simply a combination of two or more charts. 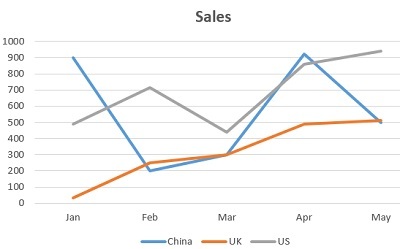 For example the combination of a column chart with a line chart. I use combination charts a lot and I think you must know how to create them as they are very useful. 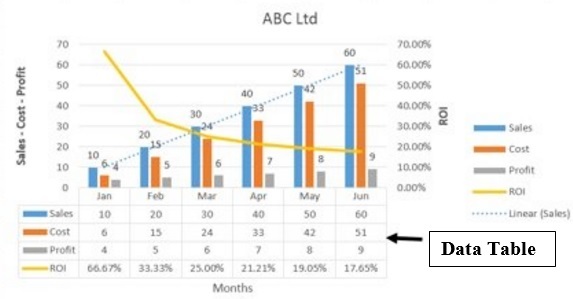 #2 Use line charts when you have too many data points to plot and the use of column or bar chart clutters the chart. When to use a number chart? 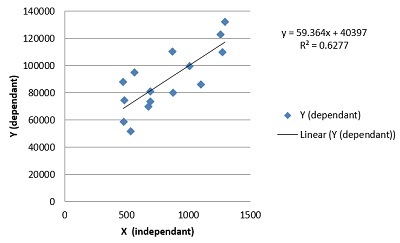 From this chart we can conclude that the relationship between the two variables (‘x’ and ‘y’) is linear. What that means, as the value of the variable ‘x’ increases there is a corresponding increase in the value of the variable ‘y’. 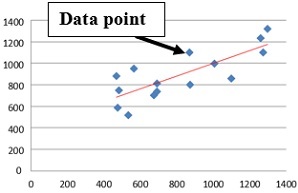 #2 Create a scatter chart only when there are ten or more data points on the horizontal axis. The more data points the better it is for a scatter chart. Conversely just a few data points (like five or six data points) are not good enough for creating a scatter chart. 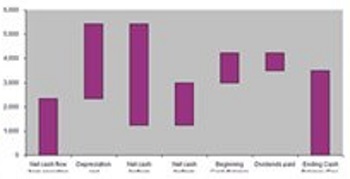 #3 Use a scatter chart when you want to show ‘why’. For example: why revenue is correlated with average order value or why conversion rate is correlated with number of transactions. 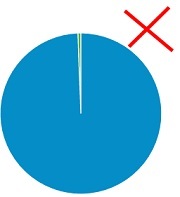 #1 Use a pie chart when you want to show 100% composition of data. In other words the various pie slices you use, must add up to 100%. What that means, do not create a pie chart where the various pie slices do not represent parts of the whole pie. #2 Use a pie chart to show composition of data only when you have got one data series and less than five categories to plot. 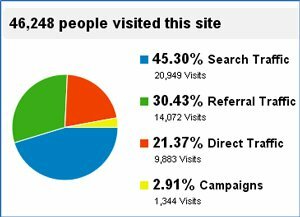 Here I have got only four categories (search traffic, referral traffic, direct traffic and campaigns) to plot. 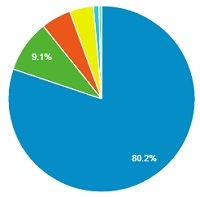 So pie chart is ideal to show the breakdown. 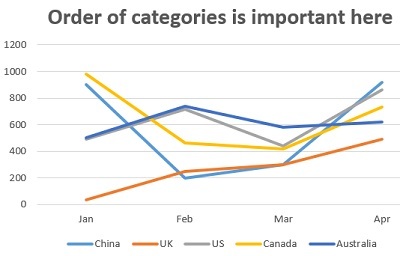 However if there were more than four categories to plot, like eight or ten categories, then the pie chart would have become cluttered and hard to read. #3 Use a pie chart to show data composition only when the pie slices are of comparable sizes. #4 Order your pie slices in such a way that as you look clockwise from top to bottom, the biggest pie slice comes first followed by second biggest pie slice and so on. In order to create a pie chart where the biggest pie slice comes first followed by second biggest pie slice and so on, I have sorted the data in decreasing order (from largest to smallest). 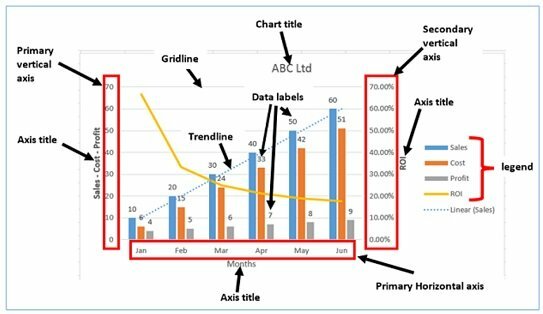 Use a stacked area chart when you want to show the trend of composition and emphasise the magnitude of change over time. Note: You would need to install the ‘Analysis ToolPak’ in order to create histogram in Excel. 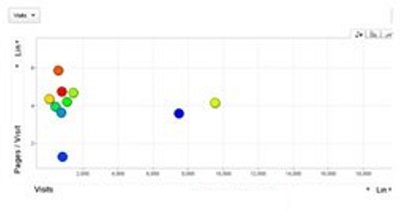 Use a Venn diagram to show overlapping of data. 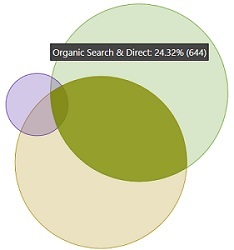 In the context of web analytics, we can use a Venn diagram to determine whether or not a website has got attribution problem. 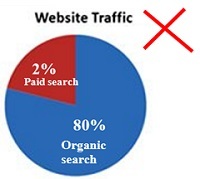 If there is little to no overlap between two or more marketing channels then the website doesn’t have attribution issues. 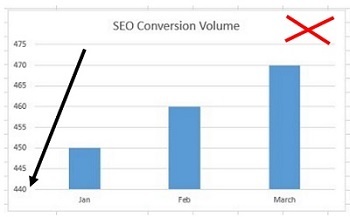 If there is a good amount of overlap then the website has got attribution issues and you should seriously consider taking multi-channel attribution into account while analyzing and interpreting the performance of marketing campaigns. The tool that I have used to create this Venn diagram is known as Venny. 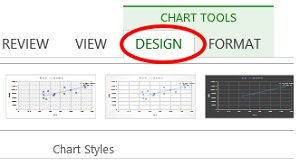 Throughout this article I have talked about the charts that should be used. But there are some charts which should be avoided for reporting purpose unless your target audience is as data savvy as you. 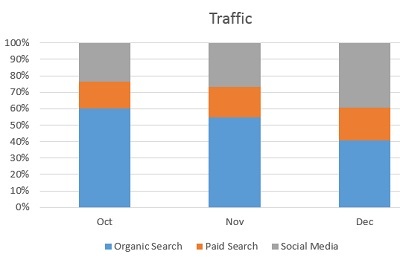 The reason you should be avoiding reporting data via these charts to your clients is simple. The majority of people have no idea what you are trying to communicate via these charts. 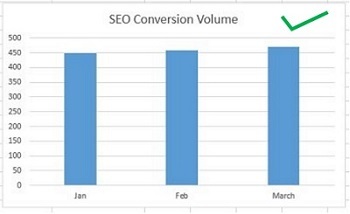 Use these charts only when your target audience is as data savvy as you. 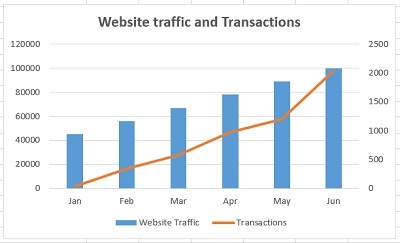 When you do not start the ‘Y’ axis value of a chart at zero, the chart does not accurately reflect the size of the variables (in case of column charts) and trend (in case of line charts). 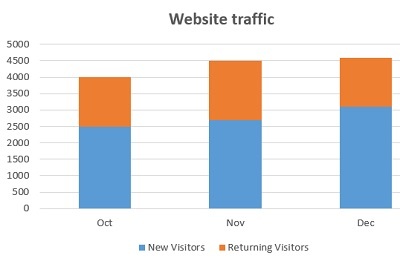 When you create a line charts with few data points, the trend that you see can be very misleading. 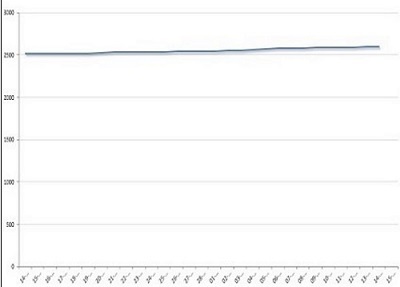 For a line chart, the more data points the better. 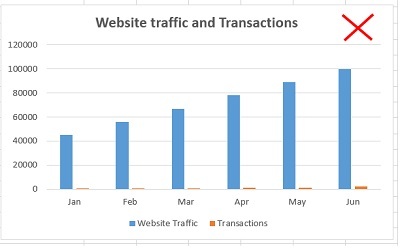 When you hide the scale of the ‘y’ axis, your chart won’t accurately reflect the size of the variables (in case of column charts) and trend (in case of line charts). 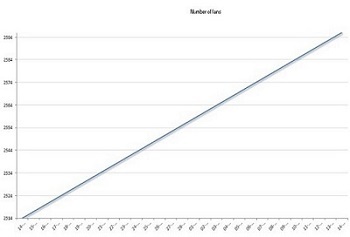 Without any scale on the y axis, there is no way of knowing where the y axis starts from. When you use such charts it create doubt on your analysis. Different people analyze and interpret same chart differently. It all depends upon the context in which they analyze and interpret the chart. No matter what chart you select, some people will always find a way to misinterpret your chart. Therefore it is critical that you provide context with your chart in the form of written commentary and describe exactly the intent of your chart. 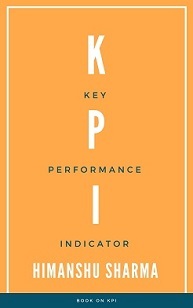 First present the context, then the insight and then the chart to support your insight.